The figure is on the extreme left, back row. This figure has slit mouth with closed eyes. His arms are held in front with his hands clasped. Rudimentary legs are folded and end in feet. See also 03.325.4527- 34. 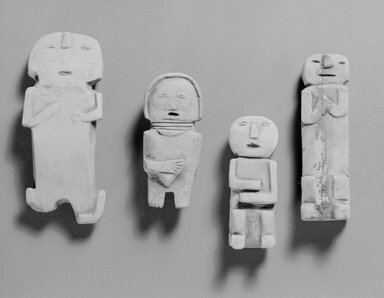 These figures were all found together inside a painted pot. They were purchased from the German trader, Cronmeyer.